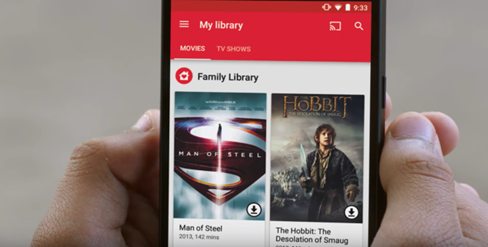 Google officially announced this morning the launch of “Family Library” – a program that allows up to six family members to share their purchases from Google Play across devices. 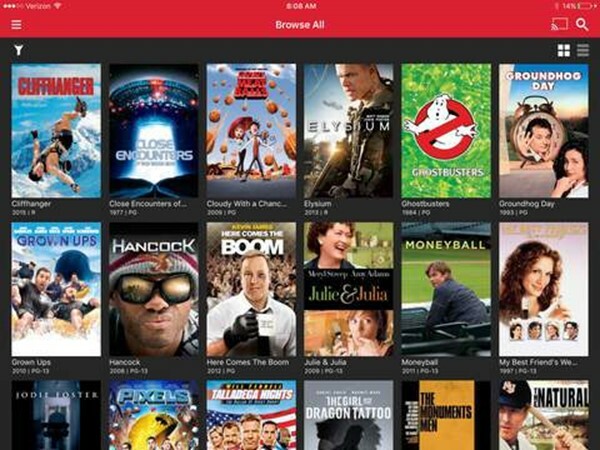 This includes the ability to share movies, TV shows, books, apps and games across Android phones and tablets, and, in some cases, across the web, iOS, and other connected TV platforms like Roku, Android TV, Smart TVs and more. Music, meanwhile, can be streamed by up to 6 family members via Google Play Music’s family plan. Family Library’s pending launch had been rumored for months, and was prematurely reported as having gone live earlier in July. However, Google is only today kicking off the official rollout, we’re told. Over the next few days, the service will become available in Australia, Brazil, Canada, France, Germany, Ireland, Italy, Japan, Mexico, New Zealand, the U.K., and the U.S.
Alongside the launch, Google is also expanding access to its Google Play Music family plan, which lets up to six family members stream songs for $14.99 per month. Previously available in the U.S., U.K., Australia, France, Germany, Brazil, Canada, and Japan, the service is now launching in Ireland, Italy, Mexico, and New Zealand. Customers can also now sign up on the web or via their Android device. To get started with Family Library, users will access a new setting in the Play Store where they will configure one person as the “Family Manager” and add the other members. The Family Manager will be an adult in the family who’s responsible for adding and removing members, and they’ll also enter in the payment information where family purchases will be charged. By default, members’ purchases will be shared with everyone, but there’s the option to selectively share items, too. That can be useful for those times when no one wants to be bothered with dad’s collection of war movies, perhaps, or mom’s cheesy rom-coms. And even if you’re sharing everything, you can still click on individual items and choose not to share them with the group. Family Library also respects the Parental Control settings you’ve configured on children’s devices, so they won’t immediately have access to your R-rated films, for example. Similar to Apple’s Family Sharing service, parents can approve purchases requested by younger family members. However, this is a bit awkward at launch. After the request is made, the parent will have to type in their password on the kids’ device. This process should be improved over time, however. What makes Google’s Family Library different from Apple’s service is that Google Play is available beyond Google’s own platform. In addition to being available across Android, movies, TV shows and books are available through Google’s apps on the web and on iOS. And you can watch movies and TV shows anywhere the Google Play Movies & TV app runs, like Roku and smart TVs. Plus, she adds, Family Library has flexible payment options. While there is a credit card that will be shared as the family payment method, members will always be able to buy items with their own payment methods, including gift cards and Google Wallet, too. T-Mobile again expanded its free streaming program Binge On this morning, with the addition of Apple Music and fifteen other providers, including video services like ABC, Fox Now, FXNOW, Disney Channel, Disney Jr., Disney XD, NAT GEO TV, DISH Anywhere, and others. This brings the total number of video providers now participating in Binge On to over 100 since the service’s launch just eight months ago, notes the company. Binge On, which is part of T-Mobile’s “UnCarrier” marketing campaign, lets customers stream music and video without tapping into their mobile data. To date, T-Mobile customers have streamed over 765 million hours of video data-free, which the carrier says contributes to longer watch times, more frequent viewing, and, for participating providers, the ability to sell more subscriptions. However, the program itself has come a long way over the past several months. T-Mobile has worked out some of the kinks with regard to the complaints larger video providers had, as with Google and YouTube. Earlier this year, YouTube and Google Play Movies & TV finally joined the program after T-Mobile addressed Google’s criticism of its program, which said that T-Mobile was unfairly throttling video without user consent. The carrier has since made it easier for end users to turn Binge On’s service on or off, and video service providers can now opt out of having their streams modified by T-Mobile. They can also choose to participate in the program, but manage their video streams themselves, giving the video provider more control. As a result of the free streaming, T-Mobile said at the beginning of the year that customers were watching more than twice as much as before – a figure it reconfirmed in March. Customers are also able to watch for longer – or, as T-Mobile says today, “hundreds of millions of extra hours” – because their high-speed data lasts up to three times longer when they stream via Binge On. Microsoft is madly in love with Cortana, the digital personal assistant that comes with every copy of the year-old Windows 10 operating system. Not only does Cortana slot right into Microsoft CEO Satya Nadella’s ambitions around artificial intelligence and the future of technology, she’s also driving lots of folks towards Bing, Microsoft’s own search engine. So it’s disappointing, but not surprising, that Microsoft is removing the ability to turn off Cortana once the Windows 10 Anniversary Update drops on August 2nd, as first reported by PC World’s Ian Paul. Previously, Windows 10 users could turn off Cortana, leaving in her place a more basic search bar that could scan your own files and folders. That means forgoing Cortana’s nifty features, including the ability to schedule reminders or see your calendar, but it’s been a worthy tradeoff for those users worried about Microsoft tracking too much user data. Now, Microsoft is removing the option. Once the update hits, if you want to search your own computer, you’re using Cortana. And unless you’re using Windows 10 at work, there’s no way to turn down the Anniversary Update or any other Windows update. Windows 10’s Cortana can present lots of personalized information provided you sign in. There’s a big caveat here: While signing in to Cortana unlocks a bunch more features, including delivering personalized news stories and access to your contacts and calendar, you don’t have to. You can use her anonymously, not tied to any account. So if you are really concerned about privacy, you should simply sign out of Cortana — but Microsoft will still get anonymous data when you use it. You can also hide the Cortana bar entirely from the taskbar. 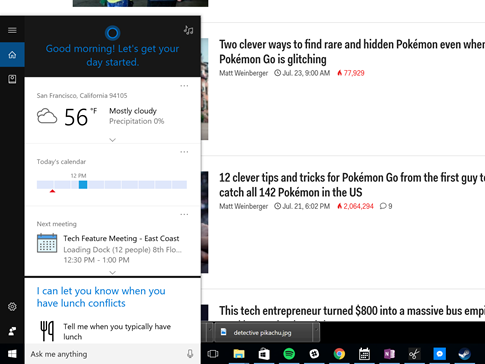 Generally speaking, Windows 10 is pretty great, and Cortana is a big part of why I personally love it so much. But it’s always disappointing to see Microsoft take away user choice, especially for something that’s as central to their day as the Windows 10 PC. This news comes after Microsoft disabled the ability to use Google when Cortana performs web searches, forcing the use of the Microsoft Edge browser and the Bing search engine. Just last week, Microsoft reported that Bing is doing better than ever, up 16% in the last quarter over the same time in 2015. Verify has missed a number of targets for user adoption and only went officially live in May 2016. Terms of this deal are not being disclosed. PointDrive was based out of Chicago and had no VC funding disclosed in Crunchbase, but Jordan Buller, a VC at Ringleader Ventures in Chicago, confirmed to me that his firm was the only institutional investor in PointDrive, with the rest its backers angels. He did not say how much the company raised. “From presentations to images, to links and videos, what they’ve created has quickly gained traction with sales professionals in a wide range of industries,” writes David Thacker, a VP of product at LinkedIn, in a blog post announcing the news. Sales Navigator today comes in two tiers. A Professional edition is designed for individuals ($80/month) and Team edition for companies ($1200/year before volume discounts). It’s not clear how and if PointDrive will be priced separately yet. Before the acquisition, it sold in tiers of $25, $40 and $50 per month per user, depending on features like expanded storage, and Salesforce integration. PointDrive’s app essentially offers users a web page that functions as a common workspace: salespeople can upload content that can be shared with their clients to better illustrate an advertisement or an exciting PowerPoint to show what great ROI they’ll get. PointDrive competes against other document sharing apps specifically targeting salespeople, such as DocSend; screen sharing services like Join.me; and online presentation platforms like Prezi. It’s interesting because it points to ways that LinkedIn could potentially expand out its sales services to a wider pool of users beyond the recruitment industry that forms a large part of its customer base, and potentially offers its social selling tools to work across other platforms beyond LinkedIn. Sales Solutions as of last quarter saw its revenues increase by 55% year-over-year, and now represents 40% of Premium Subscription revenue, LinkedIn said. Last quarter, Premium Subs brought in $149 million in revenue, meaning Sales Solutions brought in just under $60 million to the company. Feel free to dive into the documents themselves (links are at the top of the intro). According to new guidelines issued by the United States Department of Health and Human Services (HHS), ransomware incidents in HIPAA regulated organizations are now classified as a data breach. HIPAA is the Health Insurance Portability and Accountability Act that must be followed by any health care provider who transmits health information in electronic form. In America, with the use of electronic medical records, this means just about every health care provider. Although there have been rumors of ransomware that steals data, there is still no proof of any such ransomware in the wild. In fairness to the Department of Health and Human Services, the new guidelines also allow an organization to demonstrate that there is a “low probability that the Protected Health information has been compromised,” however, the 4-step risk assessment is geared more towards a general malware outbreak, rather than a ransomware event. Ransomware simply does not work the way the authors of the new HHS guidelines have implied. Even in a targeted attack, the ransomware authors are not seeking to use any of the data that is encrypted; they are after the value of the target getting back in operation. In random ransomware events, the attacker simply fires up the spam-generating engine and hope for some bites on their phishing lures. Ransomware is a lucrative business. One strain has been reported to cost victims over $18 million in one year. Ransomware criminals do not have to waste their time trying to fence stolen data. The greatest concern with this new breach classification is that it can spread to other regulations, and eventually find its way into the general practice of corporate risk officers. Nothing could be more wasteful of a security team’s time than explaining that no data was stolen every time a piece of ransomware is detected. Maintaining a patch management strategy. After the sale Yahoo will be left with cash, investments in Alibaba and Yahoo Japan, and some patents. Ailing Yahoo is selling off its operating business for about $4.8 billion to Verizon Communications, in a cash deal that will reduce the storied tech firm to mainly holding its cash, stakes in Alibaba and Yahoo Japan and non-core patents. The transaction is expected to be completed by the first quarter of next year, subject to regulatory approvals, ending a long-drawn out bidding process for the company. After the transaction is closed, Yahoo will be integrated with AOL under Marni Walden, its executive vice president and president of the Product Innovation and New Businesses organization at Verizon, the communications company said Monday. “It’s poetic to be joining forces with AOL and Verizon as we enter our next chapter focused on achieving scale on mobile,” Mayer said in a statement. Tumblr was to be Yahoo’s fresh foothold in the social media advertising market but like most of the company’s diversification and acquisitions, including its bid to get into the mobile internet, it fell short of expectations. Mobile revenue at $378 million lagged behind the company’s desktop revenue of $875 million in the second quarter. A powerful investor group, Starboard Value, said that the proposed spin off of Aabaco was not Yahoo’s best option. It prevailed on Yahoo to instead explore the sale of its core business of search and display advertising, while leaving its ownership stakes in Alibaba and Yahoo Japan in the existing corporate entity. From the sound of things, this is all still very early stages. No definite pricing or timing, but the Redbox Digital app has been published in the App Store, and screen shots reveal a UI pretty on-par with what’s offered up by Netflix and its ilk, albeit with a download option entered into the mix, along with a cast button to stream it to compatible devices. Presumably the 50 or so ratings that put the app at one star won’t tip the scales too much in either direction. Service is an app. The startup acts as an intermediary between you and businesses where you’ve had bad experiences. So this means whenever your bags are lost by an airline or a restaurant ruins your meal, Service will interface with the business on your behalf to help make things right in the form of a refund, credit, etc. After being in business a year the company’s app has been downloaded 50,000 times and saved/recouped customers a total of $1M dollars. But the current version requires you to come to Service with your issues, uploading a description of the issue and attaching proof of purchase. Not only was this a hassle (you may forget to submit the request after your awful meal) but it also leaves users with a burden of doubt (was that delay long enough to make a fuss?). So, the startup is launching Protect, a way to streamline the process to file a case. It works by connecting to your email account and monitoring your email inbox for things like flight itineraries and receipts. If you have an issue with a good or service that has an email record you just automatically tap on that transaction within Service’s app to file a case. Plus, Service will proactively monitor your flights for delays or cancelations by parsing the flight data from your email. If the delay is over 2 hours or the flight is canceled they will proactively reach out to you and ask if they can help you get compensated. Eventually, Service plan to expand this proactive monitoring feature to things like missed deliveries and and incorrect billing situations – essentially this is the start of a proactive commerce assistant that protects your purchases – almost like a 21st century version of a credit card’s consumer protection features. The new feature is bound to help increase usage for the startup, mainly because it just makes it easier to find a claim. But it isn’t a step towards monetizing, something the young company has yet to build into their product. However, Service founder and CEO Michael Schneider explained that the plan is now to leave Service free for the consumer, and monetize with businesses instead. They plan to do this by using everything they learned helping customers to develop a product that automates customer service for businesses. Service Protect is live now as part of the app’s new update.